Iappreciate the privilege that Mr Havard has extended to me in asking me to contribute this addendum to his paper on Paul Edmund Strzelecki. 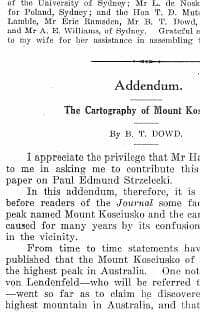 In this addendum, therefore, it is proposed to place before readers of the Journal some facts concerning the peak named Mount Kosciusko and the cartographical tangle caused for many years by its confusion with other peaks in the vicinity. From time to time statements have been made and published that the Mount Kosciusko of Strzelecki was not the highest peak in Australia. One noted scientist, Dr R. von Lendenfeld - who will be referred to at a later stage - went so far as to claim he discovered and named the highest mountain in Australia, and that Mount Kosciusko named by Strzelecki was the second highest. The writer feels that the facts revealed in this addendum refute the claim by Lendenfeld. 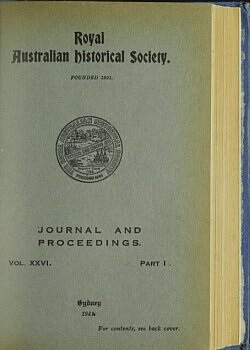 It will he noted that this research is based principally on official records, maps, and plans in the Department of Lands, Sydney, and references in the Mitchell Library, Sydney. Mention of the ascent of the Australian Alps and the naming of Mount Kosciusko by the Polish explorer in 1840 is omittcil from this addendum since it appears in Mr Havard’s paper [see pp. 55-59]. The Colonial Secretary, in a letter dated February 23, 1841, requested the Surveyor-General to have a copy taken of Strzelecki’s original route-plan (forwarded with letter) of his visit to Western Port to be kept for record purposes in the Surveyor-General's Ofﬁce. The Surveyor-General stated in his reply, dated March 16, that a copy* had been taken and the original plan returned to the Colonial Secretary, as requested. The scale of this plan, which appears to be eight miles to an inch, and the sketchy manner in which the mountain features are shown, also the route line stopping at what appears to be the foot of the mountains, make it impossible to say for certain which peak he actually ascended and named Mount Kosciusko in February, 1840. In the following - explanatory text marked with a red symbol - check below. There are, however, statements in the report** signed by Strzelecki, and in two of his letters, which have but one meaning, viz that he named the highest point of land on the Australian Alps. * Plan catalogued G. 1137 R, Department of Lands, Sydney. ** MS. copy in Mitchell Library, Sydney. In a survey of the Snowy Mountains—of which Mount Kosciusko forms a part—by Surveyor Thomas Townsend in 1846-47, his plan** shows clearly that he traversed the peak indicated on present day maps as Mount Kosciusko. This plan shows the range by the name of The Bald Mountains, with only two named peaks — The Bull‘s Peaks and The Ram’s Head. Townsend did not name Mount Kosciusko on the plan, nor could the writer trace any mention of it in his report at that time. During the year 1851 the first oficial plan (or map)*** of the County of Selwyn was completed by Surveyor Thomas Townsend — the same surveyor who traversed the Snowy Mountains and Mount Kosciusko ﬁve years previously and, possibly, the first to do so after Strzelecki’s ascent of these mountains in 1840. On this plan, Townsend shows the name Mount Kosciusko against the peak which is in the some geographical position as the Mount Kosciusko of the present day maps. As this county plan was used for a number of years as the official map of the Lands Department for charting new surveys, etc., it might be said that the name Mount Kosciusko could have been applied to the peak on the map subsequently to 1851. Expert officers of the Department who inspected the map indicated that the name was original work. In that case it would have been applied by Townsend, and no surveyor was more familiar with the topographical features of this part of the colony than he, as his ﬁeld books for the years 1846 to 1850 show. In 1851 the Snowy Mountains were visited by the Rev W. B. Clarke, who was a noted scientist of this period. He referred to the mountains by the native name Muniong [or Munyang. [B. T. D.]. The map in his published book „Southern Goldfields of New South Wales”, shows Mount Kosciusko, but the scale is such that identification of its exact position is uncertain. It is noted that he received information regarding the country from Surveyor Townsend. Other scientists, including Baron F. von Mueller and Professor Neumeyer, visited these mountains between 1853 and 1860. No investigation of their writings has been made by the writer. A compilation of the first official county map of Wallace**** was published by the Surveyor-General’s Department, New South Wales, in June, 1860. The peak shown as Mount Kosciusko on this map (spelled Kosciuszko) is located in the same geographical position as that of the Mount Kosciusko of Townsend’s county of Selwyn of the year 1851, already mentioned, also of the county of Selwyn of the years 1873, 1879, 1882, and on to the present day. Its location is also in agreement with the Mount Kosciusko of the county of Wallace of 1881, 1887, and later published editions up to the present day. These county maps have been specifically mentioned to show that the official county maps in the Lands Department of New South Wales indicate that from the first county of Selwyn of 1851 to the present day the name Mount Kosciusko has been applied to the same peak. There is no record of the name ever having been officially transferred from one peak to another, as asserted by writers of geographical and historical texts, and consequently believed by many people. * This particular name is sometimes wrongly spelled Townsend. ** Plan catalogued M. 93-831, Department of Lands, Sydney. *** Plan catalogued S. 1465, being now the cancelled county map of Selwyn of 1851, Department of Lands, Sydney. **** Plan catalogued W. 1604, being new the cancelled county map of Wallace, Department of Lands, Sydney. MUELLER’S PEAK (now Mount Townsend) MISTAKEN FOR MOUNT KOSCIUSKO by survey department of Victoria and dr R. von Lendenfeld. There was an important happening about the year 1870, when the Survey Department of Victoria in its triangulation of special geographical features near the borders of Victoria and New South Wales connected to a peak which it fully believed to be Mount Kosciusko, but was not the Mount Kosciusko as recognized by New South Wales on its official maps. According to Dr R. von Lendenfeld (who will he referred to at a later stage), the peak connected to by the was locally called „Mueller’s Peak” after Baron von Mueller, who visited the Snowy Mountains about 1853 and again a few years later. On the plan* of this triangulation furnished to the Department of Lands, Sydney, the peak connected to is noted „Mt. Kosciusko (Ramshead)”. In January, 1885, came the visit to, and examination of, the Central Australian Alps (The Snowy Mountains) by the scientist, Dr R. von Lendenfeld, whose name has already been mentioned. His report was made to the Hon J. P. Abbott, M.P., Minister for Mines, under date January 21, 1885. It was a fine and comprehensive report, but portions of it do not appear to be historically or geographically accurate. Lendenfeld may have been misled by the error of the Victorian triangulation survey, already referred to. It certainly seems that he confused the peak names in his report. — MUELLER’S PEAK — The rocky peak the point where the main ridge forms a right angle open to the north east; it is maran with a large beehive-shaped, artistically built stone cairn; a local name which was established some twenty-ﬁve years ago by Mr. Spencer, who was Baron Ferdinand von Muellnr’s guide on the occasion of his ascending this Peak, in honour of this illustrious scientist. It is perfectly clear from this statement that Lendenfeld’s Mueller’s Peak is identical with the peak triangulated by the Victorian Survey Department, called by it „Kosciusko (Ramshead)”, and on which a stone cairn was built. That this peak is identical with the Mount Kosciusko of the Counties of Selwyn and Wallace, as asserted by Lendenfeld, is defritcly not correct, as the official county maps, before mentioned, show that Mount Kosciusko is about two and a quarter miles south-easterly of this peak on the main range. Lendenfeld’s Mueller’s Peak is the Mount Townsend and Townsend Trigonometrical Station of the present day. MOUNT TOWNSEND — The highest mountain, 2-1/4 miles S 8-1/2° east of Mueller's Peek, 7,256 feet high, according to my barometrical measurement. Accepting the Victorian geodetic survey of Mueller's Peak as correct, this mountain would be about 95 feet higher than is 7,851 feet. The writer’s investigation of this statement is that the peak named „Townsend” by Lendenfeld, two and a quarter miles south-easterly of Mueller's Peak: [now Mount Townsend], is no less than the Mount Kosciusko of Townsend’s 1851 County of Selwyn, of the 1860 County of Wallace, and of other editions of these maps already referred to. The „Ramshead” of Surveyor Townsend which Lendenfeld mentioned is about a further two miles south-easterly from Mount Kosciusko, or about four and a half miles from Lendenfeld’s Mueller's Peak, according to official county maps and plans. * Plan MS. 158, Department of Lands, Sydney.